MIDWINTER might be approaching but that won’t stop sports-mad Cameron Edwards from working on his bowling action. The 11-year-old doesn’t let the matter of having a right arm that ends just after the elbow hold him back either. The positive attitude – and natural talent – of the Downend School student has won him admirers across the city and beyond. Cameron, whose ambition is to follow in the footsteps of cricketing hero Jimmy Anderson and bowl fast for England, was born with his disability. His mum Sam, 30, said: “We were told that Cameron would not be able to crawl but he was up and walking at nine months and has been proving people wrong ever since. 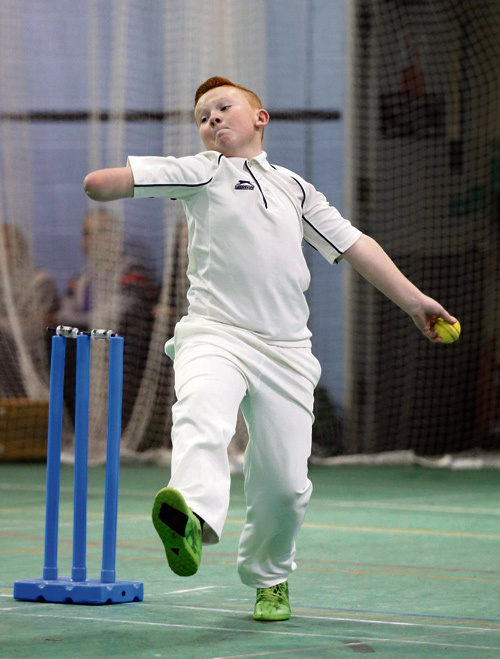 Cameron, who joined Frenchay Cricket Club at the age of nine, wears a prosthesis custom-made for him by the Bristol branch of the Remap charity when he bats, but bowling is his strength and despite the fact that he is naturally right sided last season claimed his best figures to date of 5-9, including a hat-trick. Last year became the first recipient of the Bristol Youth League’s Phil Bush Award for Endeavour. And Pak Bristolians were so impressed by his skill in a game this summer that he was recently invited along to the Whitehall-based club to receive a special award which sits proudly among an array of cups and trophies in his bedroom. Now the outdoor season is over, Cameron is a key member of Frenchay’s under-12 side, which plays in the Damian Forder Indoor League at the County Ground. Former Gloucestershire professional Damian, who has helped Cameron along the way with one-to-one coaching sessions, said: “He’s a real inspiration and an incredible lad. From the start it’s always been about what Cameron can do, not what he can’t do. Cameron is also a keen footballer for Mangotsfield United Juniors and impressed enough as a defender to be asked to train with the West Brom Academy. Sam said: “The first time we went along it soon became clear that no one had mentioned anything to the coaches who were a bit taken aback. “Someone said Cameron couldn’t play because he can’t pull the shirts of the other players, but Cameron’s attitude is that football should be about what you do with your feet! “We were told that there has never been a professional who has even lost a finger, let alone a limb, but once they saw Cameron play they said he was too good to let go. Cameron, nicknamed Scholesy by his soccer mates because he plays with the same determination as the flame-haired former Manchester United midfielder, has developed a wicked sense of humour to deal with the stares and inquisitive comments that occasionally come his way. He said: “Sometimes I’ll get asked what happened to my arm so I tell them that it was bitten off by a shark!